I try not to inflict poetry on you folks, but tonight this seems fitting. Today, the light died in Neyland Stadium for the last time in 2017. Today, twenty-two seniors stepped onto the field for the last time at the University of Tennessee. Today, legendary radio announcer and beloved Volunteer legend John Ward wept as everyone in Neyland Stadium stood up in a spontaneous outpouring of love and respect. Today, the University of Tennessee football program hit a low no one could have ever anticipated. 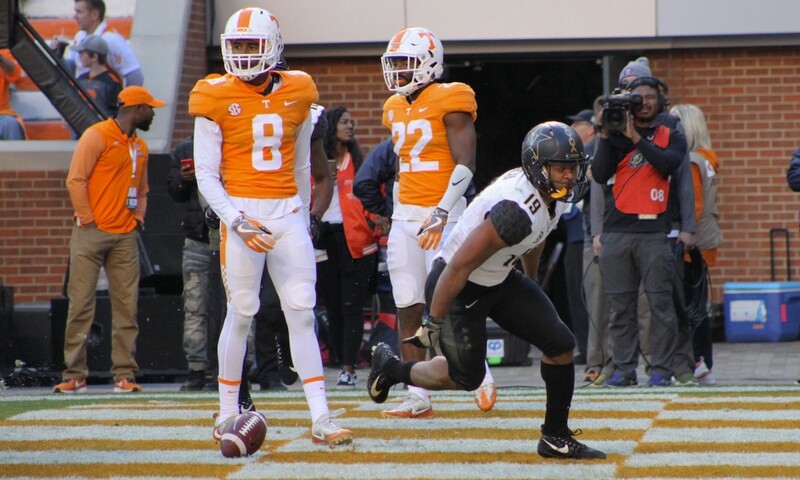 The worst season in UT history was culminated with a blowout loss to Vanderbilt, a winless record in the SEC, and for the first time ever an 8-loss season. A look at the Tennessee football program as the 2017 squad left the field on Saturday night was the saddest ongoing disaster in college football. To watch helplessly as one of the great, storied schools floundered and bumbled and fumbled and blustered its reputation and history away like a used hot dog wrapper felt like some kind of Greek tragedy, where hubris and arrogance collide in some horror-fest two weeks after the title character died. The tragedy of Butch Jones. In almost but not quite five acts. The nightmare that was UT this football season is, obviously, unprecedented and therefore uncharted territory for Vols fans and athletes both. So now we ask ourselves this. What’s next? There’s only one way to make this nightmare bearable, and that’s the right coaching hire. God help Tennessee if they trot out a new head coach without the resume or cachet to pacify the fan base. No room for error with this search. Not anymore. But as I watched the waning minutes of the UT season ticking away on the clock, I was struck by a single, persistent string of thoughts. The Tennessee seniors who just played their last game. John Ward, who was the first person little kids in Tennessee learned to imitate. The UT greats, like Phil Fulmer and Eric Berry who were in Neyland for the game. The men whose names are inscribed inside Neyland Stadium’s Ring of Honor, and enshrined there as the very best of the best. The fans, who once listened to Ward calling the games on the radio (back when we all took portable radios to Neyland so we could do just that) and who have loved these seniors. All these people are owed a huge apology. Not a “sorry we were curb-stomped by Vanderbilt” apology, but a “sorry we let this happen to our program” apology, and that must come from the Tennessee athletic department, administration, chancellor, and board of regents. The caretakers of a football tradition that was a source of pride to the entire state of Tennessee couldn’t have destroyed UT’s proud legacy any more thoroughly if they’d set out to deliberately do so. Today a giant fell, and it fell into the dust. Ashes are all that remain after a decade of horrific decisions, the obfuscation of the truth, and catering to specific interests (or individuals) to the cost of everyone who’s ever worn the orange and white. So pay attention this week, Vols fans. Rumor has it that Tennessee will announce a new head coach within days. The selection of that man will send a strong signal to not just Vol Nation, but the rest of the SEC and college football as well. The most profitable football program in the SEC has no more excuses. Plenty of dollars in the bank. Plenty of candidates out there. Plenty of opportunities to knock this hire out of the park. If this new head football coach isn’t an elite hire, then we’ll all know what the future holds for Knoxville and that’s a horrible, tragic thought. But regardless, as we look into the long gloomy night of the Tennessee off-season, there are still things that must be said. Not by me, not by the fans or the players or the media, but the University of Tennessee. We are sorry. You deserved so much better. To our players, we are sorry we left thirty of you off the sidelines for our last game because of injuries exacerbated by egregious mismanagement. To our seniors, we are sorry we put you through the worst season in Tennessee history. We are sorry we didn’t do our best for you. To our alumni and fans, we are sorry that we stood by and let our program be destroyed from within. We did not do our best for you. To John Ward, we are sorry that as you cried tears of joy at the honor you received from Tennessee fans, the seeds were already sown for you to witness the ultimate destruction of the program you love. We did not do our best for you. We have not given OUR all for Tennessee in the past decade, and for that we’re sorry. We did not do our best for you. For over a century, we, the fans, have done our best for you. Accept responsibility for the nightmare you have inflicted upon Vol Nation. Your real job starts now. No more excuses. Time to do your best because as of tonight, you’ve done your worst. Tonight, as the lights go out at Neyland Stadium, the cold silence of a Tennessee twilight ushers in the darkest night in the history of the program. Not a good night, but a night when the stars are shrouded and the shadows are deep. Time to do your best for everyone concerned, Tennessee. This Tennessee darkness, this bleak night, has been self-inflicted. Time to compensate for these long-lost shadows of greatness that will haunt the immense silence of Neyland Stadium this off-season. Tonight, the world witnessed the lowest Tennessee has ever been. Make the next moment in Neyland one that rages against the darkness of 2017 and ushers in the light of 2018.